I feel like I haven't written a post in WAY to long! As most of you know, I got engaged last week (you can read more about it here) Ekkk! Still can't contain my excitement about it but since then I have been wedding planing/researching nonstop! It is so hard to pull myself away from browsing wedding websites and get back to my long to-do list for the start of the school year. But I did manage to pull myself away for a little while to work on a few aspects of the Daily 5. For my spelling, I use Words Their Way spelling sorts. I give a spelling inventory at the beginning of the year (and each quarter there after) and put students in groups based on their spelling needs. Mondays I'll be giving students their new spelling sorts. The sorts will be right on their desks so when they enter class Monday morning their morning work will be to cut up their words. Their words go in a basic envelope that are kept inside their word work spiral notebook. 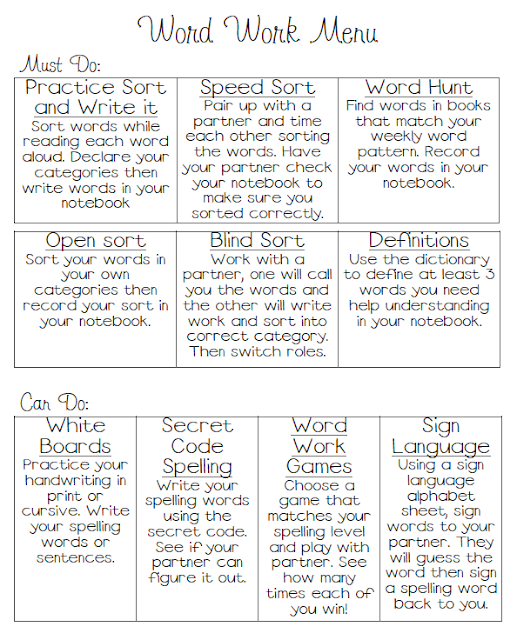 Also another spelling sort is on their desk to take home to use for homework. During the Daily 5 on Monday I will be meeting with each spelling group and talking about their new words. The words will already be cut up and we will be ready to work. On this day student's will NOT be choosing word work as a Daily 5 choice since that is what they will be doing with me! When we check in as a class and students make their Daily 5 choices I'll just simply call on the students who will meet with me and they will forgo making a choice. Note, I'm not with them for the entire rotation. I meet with them and deliver a short mini-less on their word pattern then leave them to sort the words on their own and write them in their notebook for the remaining time (expect at the beginning of the year I'll stay with them).They will begin working on their 'Work Work Menu' at this time. I sometimes check back in with them to see how it is going and if they have questions. Student will be in a group though to help each other if questions do arise and I'm busy. After I'm finished with the mini word work lesson I'll check my conferring notebook for appointments I have with other student. These appointments are on the student's reading goals (read more about my conferring notebook and appointments here). I will use a Must Do and Can Do 'Word Work Menu' to help students focus on what to do for Word Work Monday and the rest of the week. I still really wanted to give student choice on the order they do the activities. I also wanted to give them some fun 'can do' activities to motivate and instill a sense of urgency for them to complete all the 'must do' items sooner rather than later. I know there are 6 'must do' items which seems like a lot to do in 5 days however students figure out how to pace themselves. Also some activities don't take up the entire 15-20 minute rotation so student's can finish 2-3 in one day. If it is too much for some students then it can be adjusted (complete 4/6 must do's) but want to start with high expectations! All of the 'must do' items go in the student's word work notebooks so no worksheets needed. The ideas I have are taken right from Words Their Way. I will be checking their notebooks weekly, when I meet with them to take their spelling tests. On student's spelling tests they will also rate and reflect how well they did in their word work notebook. The 'Can Do' items are just extra practice therefore no need to check them and some of the items don't require paper anyway like sign language and white boards. As the year progresses the 'Can Do' items might change depending on my resources. For example, I might add Boggle or using Scrabble Tiles then adding up how much the words are worth. I'd recommend use what you have available first then see what might work with your class. Fridays are when I'll administer their spelling tests. I'll do it during Daily 5 and pull groups just as I do on Monday. I would LOVE to have a parent volunteer do this but we will see if I can recruit one (not too likely). As I said above, I'll also check and/or collect the student's word work notebooks to check if I don't finish. I don't particularly love taking two days of small group to do Work Work but I won't be doing any whole group lessons on their word patterns since students have different lists. You always have to sacrifice some time as a teacher! Also if students are having a rough time with a pattern then I can round up the group again and meet with them another time during the week. It is totally based on the student's needs. I will be checking in with them through out the week to see how things are going during our one-on-one conferences. 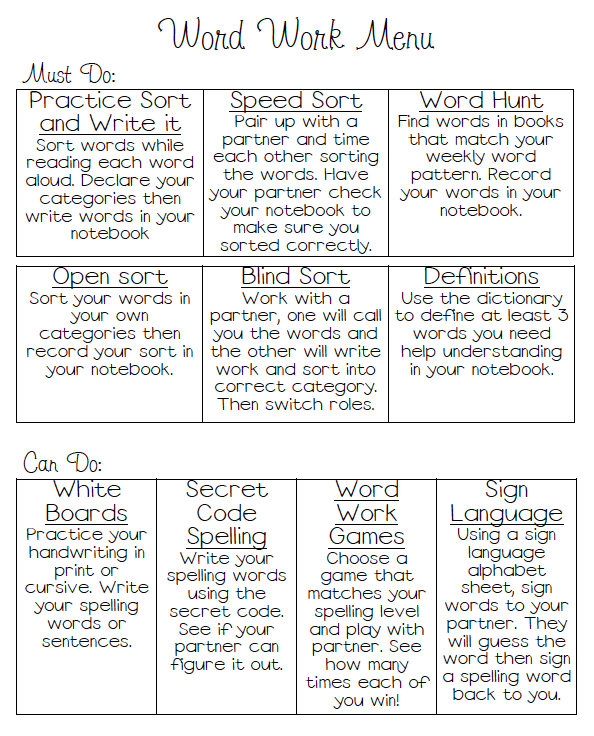 Download a copy of my word work menu with directions for Secret Code Spelling, Sign Language Picture to assist in student's practicing, and cursive guide for student's to practice their spelling words HERE. There are many teachers out there that use Words their Way. Your post here has inspired me that it is a must do. Your post could not have come at a better time! I am grappling with how to mesh WTW within the Daily 5 structure. . . between your ideas and another blogger, I think I've got a much better idea of how it will work in my class. Thanks! Can you please tell me what fonts you use on this word work menu? I am trying to locate them for my wife. That's exactly what I was wondering. The font looks like Monotype, but it is different. Any guess? I would love to download this but for some reason I can't get it to download. Any way you could send it to me? sandeli@tulsaschools.org I would greatly appreciate it!! I cannot download your must do/can do board either. Please email it to me if possible. Thank you so much for sharing this great idea! Do you use the Words Their Way student notebooks with the teacher resource book and do you have the big book of Rhymes and resource CD? I love that you use a spelling inventory to determine spelling words! I also love that you are using Words Their Way for Daily 5 Word Work. It's obvious that you have put a lot of thought into this. It's wonderful!!! Thank you so much for sharing! I love WTW! I couldn't believe the vocabulary building with such simple pictures. Building on common spelling patterns has been proven to be much more effective than an old school spelling list. I've moved from 1st to 4th and continue to plan on using WTW in my own classroom. VERY EFFECTIVE!!!! Dear Amber- I am so appreciative of your resources. I was wondering if you could tell me (a brand new teacher) if you give each student a copy of the can/must dos for word work, if you put it on the wall, and how you hold the kids accountable? I want to implement this as soon as I wrap my head around it. Also, would you be willing to share your menu in word format? In your bio you use the incorrect from of "your" - it is a contraction for "you are" and therefore should say "you're"
This is a wonderful resource as I prepare for a new school year! Love WTW. Thanks for sharing! It is not surprising that there are so many grateful teachers, who will be able to use your ideas and tips for their lessons. At the same time, I think that it is an excellent resource for parents, as the can do more than just checking Essay Service Reviews for choosing the service where they will order papers for their kids. I don’t blame them, because it is difficult to teach when you have no support. The paraphrase services are best for students who have problem in english writing. The grammar mistakes are common problem which can be now solved. The essay paraphrase generator is quite important and necessary if you can't write well. It gives best look.